We Love Soaps: New Holiday Movies This Weekend Starring Vivica A. Fox, Debbi Morgan, Tichina Arnold, Faith Ford, Ryan McPartlin & More! New Holiday Movies This Weekend Starring Vivica A. Fox, Debbi Morgan, Tichina Arnold, Faith Ford, Ryan McPartlin & More! the many stars in the A Royal Family Christmas ensemble. Several new holiday movies premiere this weekend, and the casts feature a number of former soap opera stars. Check out our updated guest stars guide below to find out when your favorite will be airing in the coming days. 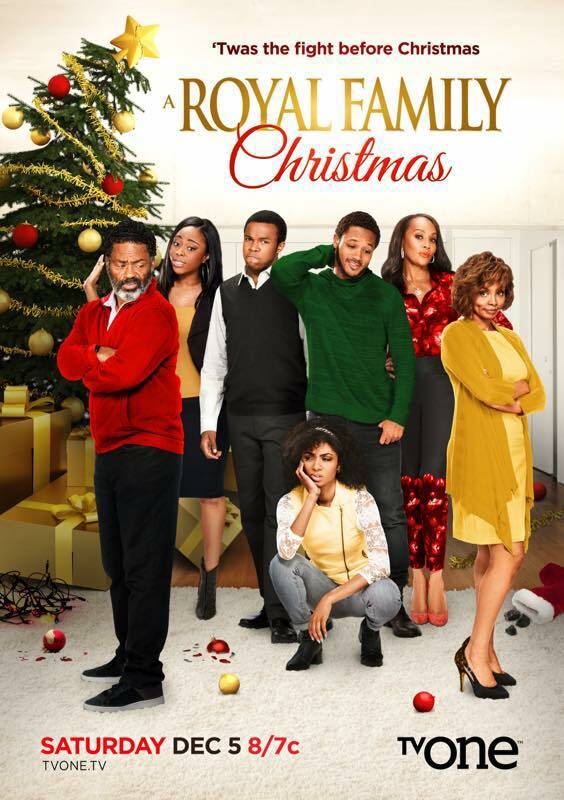 * A Royal Family Christmas movie premiere (8 p.m. ET on TV One) - Vivica A. Fox (ex-Maya Reubens, Generations), Debbi Morgan (ex-Angie Hubbard, All My Children) and Tichina Arnold (ex-Zena, Ryan's Hope) star. In the sequel to A Royal Family Holiday, the children Phillip "Flip" Royal (Romeo Miller), a good-looking spiritual guru; Austin Royal (Eric Myrick III) a Washington, D.C. community activist running for Congress; Kelsey Royal (Chelsea Tavares) a fashion designer's gopher; and Pamela Royal (Tequilla Whitfield) a hair and nail salon owner join forces to attempt to reunite their parents in time for Christmas. They try every trick in the book - including "playing nice" and setting aside old sibling rivalries - only to learn their mom and dad are enjoying "the single life." Their plan also goes awry as getting their parents back together ends up taking a back seat to their own personal and professional drama. * Just in Time for Christmas movie premiere (8 p.m. ET/PT on Hallmark Channel) - Eloise Mumford (ex-Lindsay Holloway, Lone Star), Michael Stahl-David, William Shatner and Christopher Lloyd star. Lindsay Rogers (Mumford) has to make a tough decision: stay in her small town hometown and marry longtime beau and coffee shop owner Jason Stewart (Stahl-David), or accept a once in a lifetime job offer, teaching at an Ivy League college thousand of miles away. * The Flight Before Christmas movie premiere (8 p.m. ET/PT on Lifetime) - Mayim Bialik and Ryan McPartlin (ex-Hank Bennett, Passions) star. Excited to take the next step in their relationship and move in with her boyfriend, Stephanie (Bialik) is crushed when he drops the bombshell that he wants to break up. Faced with spending the holidays heartbroken and homeless, she decides to fly home to Connecticut. On a red-eye the day before Christmas, Stephanie finds herself seated next to Michael (McPartlin), who is planning to propose to his college girlfriend. The two get off to a rocky start but things get even worse when the pilot announces that a huge, unexpected snowstorm is crossing the country. Their flight is diverted to a small town in Montana where Stephanie snags the last available room at the town's bed and breakfast. Despite their differences, she offers to share the room with Michael and try their best to get along. Reginald VelJohnson and Jo Marie Payton also star. * Merry Kissmas movie premiere (9 p.m. ET/PT on ION) - The holiday film stars Karissa Staples, Brant Daugherty (ex-Brian, Days of our Lives), Brittany Underwood (ex-Langston Wilde, One Life to Live), Ion Overman (ex-Gabriella Garza, Port Charles), Roxanne Hart and Doris Roberts. Unwinding her relationship from a controlling choreographer, Kayla (Staples) happens to fall for a handsome man, Dustin (Daugherty), who she shares a magical kiss with on a chance elevator encounter. But, when the choreographer begins to make nice and Dustin is the one who makes some missteps, Kayla is torn on which man she really loves. The cast includes Ben Levin, who played Gabriel Caras on As the World Turns in 2010. * Karen Kingsbury's The Bridge movie premiere (8 p.m. ET/PT on Hallmark Channel) - Katie Findlay, Wyatt Nash, Ted McGinley and Faith Ford (ex-Julia Shearer, Another World) star. The sweeping tale of Molly Callens (Findlay) and Ryan Kelly (Nash), two young students who share a profound friendship their first semester in college, a time that becomes the defining moment of their lives. * Last Chance Christmas movie premiere (9 p.m. ET/PT on Lifetime - Hilarie Burton (One Tree Hill), Gabriel Hogan (Heartland) and Tim Matheson (Hart of Dixie) star. When Prancer injures his hoof, Santa's stable hand John must find a fill in to ensure Christmas deliveries go off without a hitch. His mission gets complicated when he discovers that Frankie, the perfect substitute reindeer, belongs to a precocious 8-year-old girl and her mother Annie. As he races to get Frankie up to the North Pole, he realizes that he's actually falling in love with Annie and has to find a way to win her over and save Christmas at the same time. * Telenovela (10 p.m. ET/PT on NBC) - Eva Longoria (ex-Isabella Braña Williams, The Young and the Restless) stars in this big, fun and flashy half-hour comedy as Ana Sofia, the star of a popular Spanish language soap opera. One problem, she doesn't speak any Spanish. Other problems? Ana must manage a new boss, jealous castmates and high-maintenance best friends - and that's all before her ex-husband is hired as her new on-screen love interest. Just like a real telenovela, this comedy is full of all kinds of drama, including love, hate, life and even death! Despite all the chaos, this telenovela's cast and crew is a family ... or, at least, they try to be. The cast includes Jencarlos Canela, Diana Maria Riva, Jose Moreno Brooks, Alex Meneses, Amaury Nolasco, Jadyn Douglas, and Izzy Diaz. NBC is airing a two-episode preview before the show's January 4 premiere. * Chicago Med (9 p.m. ET/PT on NBC) - Julie Berman (ex-Lulu Spencer, General Hospital) makes her second appearance as Dr. Sam Zanetti. * Empire (9 p.m. ET/PT on FOX) - Marisa Tomei (ex-Marcy Thompson Cushing, As the World Turns) plays Mimi Whiteman. William Fichtner (ex-Josh Snyder, As the World Turns) returns as Jamieson.